During the fifth century BC, philosopher Socrates often engaged in free-flowing discussions with groups of young citizens. Through these discussions he developed the Socratic Method, designed to develop a truer understanding of the underlying issues in both the subject and the speaker, which made a profound impact on modern society. Sam Houston State University will adopt Socrates’ approach by bringing together a variety of renowned experts for a night of conversation on topics relevant to the world and education during the first “Let’s Talk” on March 27. Proceeds benefit scholarships for SHSU’s Honors Program. During the event, experts from various backgrounds will lead discussions with a table of 10 over dinner. 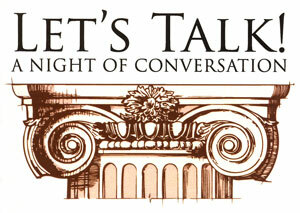 “Let’s Talk” will begin at 6:30 p.m. in the Lowman Student Center Ballroom with cocktails, followed by dinner and conversation at 7:30 p.m. and coffee and dessert at 8:30 p.m. After the event, books by the speakers will also be sold and autographed. “We tried to bring in people who have a topic we thought would be challenging and interesting for people to know about and that they would enjoy knowing more about but also to have the opportunity to actually have a discussion about this,” said Nancy Gaertner, “Let’s Talk” chair. Discussion leaders will include both SHSU and non-university affiliated speakers, including U.S. Rep. Kevin Brady, executive director and chief executive officer of the Houston Symphony Orchestra Matthew VanBesien, restaurant entrepreneur Nash D’Amico, three-time Nobel Peace Prize nominee and missionary Kemper Crabb and a number of SHSU professors. “Dr. (Sam) Souyal, in criminal justice, is going to talk about civility, how important it is and how we’re losing that,” Gaertner said. “He was telling me, and I agree, that that’s why Barack Obama has been so popular, because he is coming across as this honorable, civil man who feels he has something to bring to the United States. SHSU assistant professor of criminal justice and forensic anthropologist Joan Bytheway, whose findings from studies of Saddam Hussein’s mass grave victims were used at his trial, will also lead a table. For those affiliated with SHSU, Gaertner said “Let’s Talk” is a great opportunity to “let them shine and show what they do and let people outside of campus come in and see all of the wonderful things we have going on here,” she said. Every person asked to participate agreed to do so, she said. Tickets are $100 for the entire evening, a portion of which is tax deductible. Sponsorships are also still available at four different levels. Seats will be available on a first-come, first-served basis. Other “Let’s Talk” discussion leaders will include T.O. Souryal, orthopedic physician and team physician for the Dallas Mavericks; Jim Olson, author and distinguished professor of history; Mike Yawn, adjunct professor of political science; John Thompson, Polk County judge and I-69 corridor chairman; Charles Matthews, Texas State University System chancellor; Shirley Neeley Richardson, immediate past Texas Commissioner of Education; Marcus Luttrell, retired Navy Seal and author; and David Adickes, world renowned artist and sculptor. Also, Tony Mandola and Damian Mandola, restaurant entrepreneurs; Randy Garner, criminal justice professor; Jim Bexley, Smith-Hutson Chair of Banking; Jane Monday and Fran Vick, authors; Mitch Roth, criminal justice professor; Rich Ballinger, PGA/PGM program director; Mickey Herskowitz, author and former Houston Chronicle journalist; Mark Johnson, head baseball coach; Renee James, associate professor of physics; and Sarah Kerrigan, forensic science program director. For more on their presentations, visit www.shsu.edu/letstalk. Reservation forms are also available online or can be made by calling Rhonda Ellisor at 936.294.4050. For more information, contact Rhonda Curry, in the President’s Office, at 936.294.4758.